What does a boss do to reward a sleep-starved morning show staff when the show notches another ratings win? Buys them coffee, of course. At Rockefeller Center on Thursday, free Starbucks drinks and desserts were NBC's restrained way of recognizing that the "Today" show has now beaten arch-rival "Good Morning America" three of the past four weeks. The hosts and executives don't want to get carried away. The title of #1 morning show is still very much up for grabs. But that, in itself, is worth celebrating for the "Today" show, which has spent three frustrating years as the #2 show. ABC's "GMA" has given up ground recently, particularly in the advertiser demographic that both networks covet, ages adults 25 to 54. "Today" won a week in April, two weeks in May, and now a week in June. Ratings for the week of June 1 came out on Thursday, and the data underscored just how tight the race is. "Today," co-hosted by Matt Lauer and Savannah Guthrie, was ahead of "GMA" for the week by just 9,000 viewers ages 25 to 54. But a win is a win, contributing to a comeback story for NBC's famed morning show and adding to ABC's anxiety. NBC News President Deborah Turness promptly sent the "Today" show staff a "Celebrate With Caffeine!" email, inviting them downstairs to Starbucks. "Enjoy, and please know how much your great work and amazing results are appreciated," she wrote in an internal memo obtained by CNNMoney. The results matter because the morning shows are huge moneymakers for their networks. 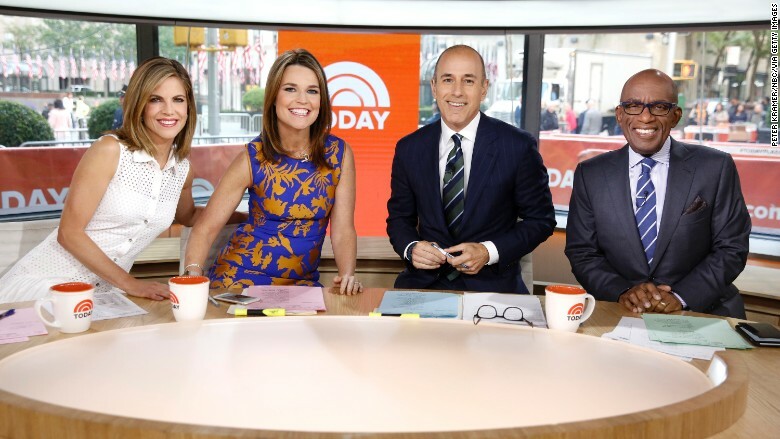 The "Today" show earned $435 million for NBC last year, according to Kantar Media. Being on top in the weekly ratings race helps keep the advertising revenue flowing. It is also important for morale. There is no television war quite like the morning show war between "Today" and "GMA." The recent ratings wins have been particularly satisfying for the "Today" show hosts and producers who slogged through the bad press associated with Ann Curry's departure in 2012 and the abrupt hiring and firing of a top executive last year. The wins are also a bright spot for NBC at a time when everyone there -- and at its rival networks -- is awaiting a decision about anchorman Brian Williams' fate. At an awards ceremony Thursday Guthrie told TVNewser, "I think, like everyone, we are waiting to see what our bosses decide, and we hope for the best for everyone involved."